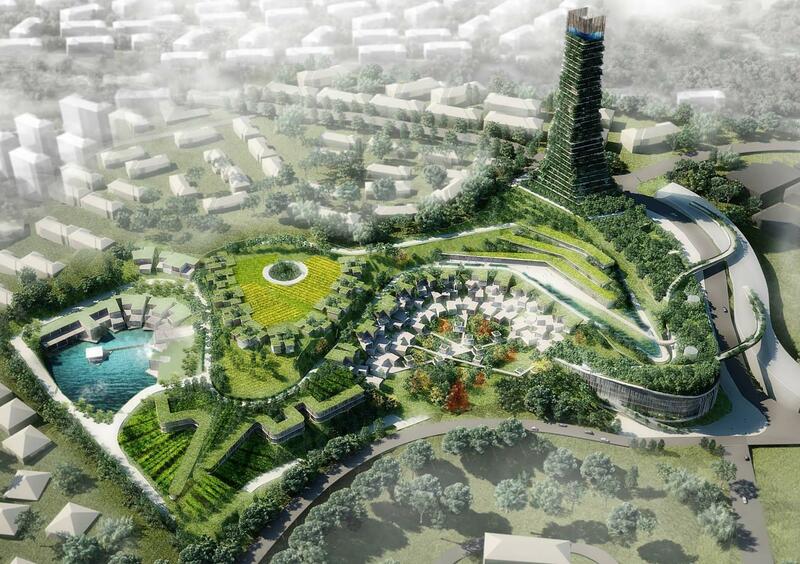 Nearly every city in the world struggles with air pollution, but one province in China has taken a major step towards drastically reducing air pollution by planning the world's first "forest city." The community of around 30,000 people in Liuzhou, Guangxi Province, China will live up to its title by integrating nearly one million plants of more than 100 different species into its urban landscape, with an additional 40,000 trees. These plants will appear along roadways and in parks as well as on the outer walls of buildings and other structures. From top to bottom, the city will be blanketed in greenery. The World Health Organization estimates that air pollution causes around 7 million premature deaths each year. Polluted air can contain high concentrations of CO2, which contributes to the buildup of greenhouse gasses in earth's atmosphere, leading to further climate change. According to the Numbeo Pollution Index, China is the sixth most polluted country in the world, with a pollution index of 88.96. As one might imagine, this pollution is most apparent in China's urban areas. It's estimated that the forest city will pack enough air-cleaning power to absorb around 10,000 tons of carbon dioxide from the air, along with 57 tons of pollutants every year. On top of that, around 900 tons of oxygen will be produced each year, and shade from the trees and other plants will help keep city air cool. Plant life will also serve as an effective barrier against urban noise, which can cause hearing loss and stress. The city was designed by Stefano Boeri Archietti, an architecture team that creates eco-freindly buildings and other projects around their world. Their famous "vertical forest" residential buildings in Milan, pictured above, have served as an inspiration to other green builders around the world, and have proven that such buildings, with balconies and ledges covered in plants, are possible to maintain in the heart of busy cities. Since their opening in 2014, the buildings have won several prestigious awards, including the International Highrise Award in 2014 and the title of "2015 Best Tall Building Worldwide" in 2015. Besides being covered in plants, the forest city will also make use of renewable energy sources, such as solar and geothermal energy. This will further cut down on air pollution and CO2 emissions. This power will help run, among other businesses and residences, a hospital and two schools. A fast rail line for electric cars will run through the city, connecting it to nearby Liuzhou. Although blueprints for similar architectural concepts have been seen in the last few years, the forest city will be the world's first true green city. Like the "vertical forest" buildings in Milan, the project will likely produce results that have never been seen before. It's easy to imagine that the forest city's success will inspire other, similar projects around the world, by demonstrating that such cities are not only possible to build, but possible to maintain long term--and well worth the effort.